MSG converter tool imports multiple numbers of MSG files into PST that too very easily. The software allows the conversions of a wide range of MSG files that are stored on the hard drive of the local machine. The meta properties like To, Cc, Bcc, Date, attachment etc are also maintained for every migration to Outlook. MSG to PST converter tool provides an option of viewing MSG data files in multiple view modes. These views can be useful for forensic examination of MSG files. The user is facilitated with views like Normal View, HTML view, Hex view, Property view, message header view, MIME view, attachment view etc. To change the view mode click on respective view tab before performing MSG file to PST conversion. The user can export selective MSG 2 PST or convert all emails to Outlook file format. The MSG converter tool can create PST files for selective MSG files only. So that the user does not have to import the entire files. By simply checking and unchecking the emails, the user can achieve this and then can click on export button to complete the procedure. MSG to PST File Converter Tool has windows explorer style interface which facilitate an easy approach to load files. Software is smart enough to load all MSG files residing inside a particular folder, here user only need to specify the folder containing MSG files and software will intelligently detect & load these files. Convert MSG software load multiple files with its associate attributes like from, subject, To, sent, received, and size in KB etc. And if you want to sort MSG files according to your convenience then the software allow you to sort MSG emails according to the above specified attributes. The utility Convert MSG to Outlook PST in a feasible manner and provides manageable Output to the user. Moreover, MSG file converter supports splitting of PST files according to size. This feature helps to break large PST file into smaller and manageable ones. User just need to specify the size limit to split PST file. MSG to PST exporter software generate UNICODE type PST file which overcome the 2 GB file size limitation. Thus you can create large PST file for multiple MSG files without considering about the PST file size. MSG is a file extension which stores individual outlook emails. Each MSG file stores email in plain ASCII text with their message body, header, and attachments. MSG files cannot be viewed or open using a normal text editor and it requires an email client which support MAPI just like as MS Outlook, Bat!, Windows Mail, MDaemon etc. MSG is created in MS Outlook when you save a particular email as Outlook message format file type or simply drag & drop particular email from Outlook. Why We Convert MSG to PST? Sometimes user got a large number of MSG files from various sources and user wants to keep them into one single file which could happen by converting them into a PST file. We always prefer PST over MSG file as PST file can store emails, contacts, calendars, tasks etc in contrast with MSG which can store only single email with associated attributes. PST files are also used to keep backup or archive of data items. So its better to convert multiple MSG files into PST file. How to Convert MSG to PST? There is no such manual approach available to convert MSG file to PST but you can access and view MSG file with Outlook just by dragging and dropping MSG files to Outlook. But this approach seams to be infeasible under the scenario of having thousands of MSG files so here you will require atomization. 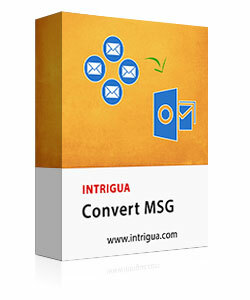 INRIGUA Convert MSG is the tool which will bring this atomization of conversion by allowing a user to export multiple MSG files to PST at once without affecting the overall integrity of files. Step 1: Launch MSG to PST Converter software on your system. Step 3: Select MSG Files that can be viewed in the software. Step 4: Hit the Export button after choosing the browse location. Click to watch this interactive video of Convert MSG tool which will guide our users in respect of how to convert MSG to PST file. Get an easy and clear approach from this video and start with conversion process. What features would I be facilitated with on purchasing the software? Export multiple MSG files to PST at one time without any issue. Provided the features of sorting the MSg files with respect to their attributes. Provision to split PST file by size while importing .msg files to .pst. Import MSG file to PST without any file size limitations. Supports Windows 10, 8.1 and all the below versions to move MSG file to PST. Can we Convert MSG to PST file on latest windows 10? No, MSG file converter is compatible upto Windows 8 only. So you cannot convert MSG file to PST on windows 10 OS. Is this tool convert multiple MSG files at once? Yes, you can convert as many as you want to convert MSG files to PST with this tool at once. Do I need to have MS Outlook installed on my machine to carry out this conversion? No, Convert MSG tool can work without MS Outlook environment effectively. Can MSG file to PST converter migrate emails along with attachments? Yes, our MSG to Outlook Converter also migrate attachments associated with the emails. You can even preview the attachments while converting them to PSt file format. Is there any file size limitation on MSG file while importing it into Outlook? No, there is no file size restrictions enforced on MSG files. MSF file converter can move any size of .msg file to PST very easily. Its a really incredible product for converting all MSG data to different file formats. Moreover, the support team did a great job in guiding me throughout the procedure which made it more easy to use and handle. Great job! Great tool with advanced features for converting MSG to PST along with the option of saving resultant PST into smaller files. Its a worth buying tool and is highly recommended to all MS Outlook and Exchange users. The team did a wonderful job. A big thumbs up!